If you’re working on a digital marketing campaign and your website isn’t responsive and professional, you are losing out on business. Worse, if your competitors have a great website, those lost customers are going to their websites instead. 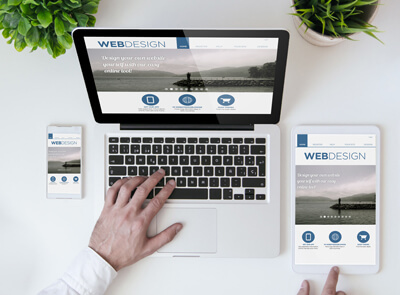 We will get your business set up with a professional, responsive, and functional website that will help your business get found online. We offer several website packages that all have such features as: keyword inclusion, XML site maps, branded emails, web storage, Google Maps, social media link integration, photo galleries, and much more. We make sure the technical aspects of the website is set up for your success. We will also make sure your website either matches your business branding, or we’ll help you create a consistent look and feel. If you want to use an existing domain, content, or email, we can set it up to work on your new website. If you need a new domain, content, or email, we can set up those things for you with your input. We will work with you every step of the way to make a site that meets your needs. We will then continue to work with you on edits, even after the site is live on the web. Edits and updates are communicated directly from you to our web design team either by email or phone with quick turn-around times and constant communication. We offer many packages to make sure that your new website is right for your business. Our common packages are a 3 pages, a 5 pages, and a 10 pages. However, we offer additional pages so you get exactly what you need. All our websites are responsive, and we can build your website in HTML or with WordPress. Call us today to review all of our offerings and let us get you set up with your new responsive website.